A global "ocean" of molten rock sloshes beneath the surface of Jupiter's moon Io, feeding the fiery satellite's prolific volcanism, a new study finds. Unlike Earth's magma, which tends to cluster in pockets around the edges of tectonic plates, Io's magma is found in a global reservoir at least 30 miles (48 kilometers) deep, the study suggests. This huge reserve of subsurface molten rock helps explain why Io is the most volcanically active object in the solar system, spewing out 100 times more lava than all of Earth's volcanoes combined. Io, the third-largest of Jupiter's many satellites, is just a touch bigger than Earth's moon. It orbits about as close to Jupiter, on average, as our moon does to Earth. Io is the only body in the solar system besides Earth known to boast active lava volcanoes (some other satellites, such as Saturn's moon Enceladus, harbor ice volcanoes). And Io is far more volcanically active than Earth. Previous theories had suggested that Io's molten rock may splash about in a subsurface ocean extending across the entire moon. But the new study is the first to offer hard evidence of that, researchers said. "It's always wonderful to have some direct proof," Khurana told SPACE.com. Khurana and his colleagues studied observations made by NASA's Galileo spacecraft, which peered at Jupiter and some of its satellites from 1995 to 2003. During four flybys of Io in 1999 and 2000, Galileo's magnetometer picked up a strange signal coming from the moon. The signal was an induced response to the rotating magnetic field of Jupiter, and it was likely produced by an electrical current in Io's subsurface rocks. That only makes sense, researchers say, if the moon has a global layer of molten or partially molten rock beneath its solid crust. Rock of the type found on Io is not very conductive when it's in solid form, but that changes dramatically when it melts. So the signal is strong evidence for a widespread, interconnected magma pool. Other research teams have used similar data and methodology to help deduce the presence of subsurface oceans on other satellites, such as Jupiter's moon Europa, Khurana said. But in those cases, the conducting medium is thought to be liquid water, not liquid rock. Further analysis and modeling suggested that at least 20 percent of the rock in the reservoir must be melted, and that the magma pool is 30 miles (48 km) deep at a minimum. It lies below Io's crust, which itself is 20 to 30 miles (32 to 48 km) thick. The magma ocean likely constitutes about 10 percent of Io's rocky mantle by volume, researchers said. Khurana and his colleagues publish their results tomorrow (May 13) in the journal Science. While the new study should help scientists better understand Io's extreme volcanism, it could also shed light on other aspects of the moon, researchers said. For example, the results could help explain why, in contrast to Earth, Io doesn't have a strong intrinsic magnetic field. Earth's internal magnetic field is thought to be generated and maintained by the circulation of convecting, electrically conductive fluid, in a phenomenon known as the dynamo effect. But Io's magma ocean may be quashing the dynamo effect by nipping convection in the bud. 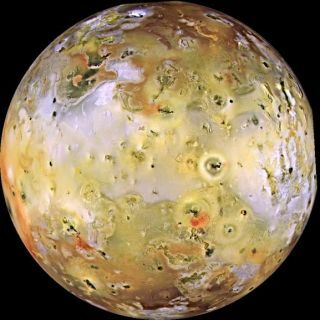 Temperatures in this scorching slurry probably top 2,200 degrees Fahrenheit (1,200 degrees Celsius), researchers said, likely making Io's mantle too hot to cool the moon's core by convection. "We are probably beginning to understand why Io doesn't have a dynamo-generated magnetic field," Khurana said. The new study could also provide researchers a sort of window into the Earth's past, Khurana said. Both Earth and our moon are thought to have possessed underground magma oceans like Io's, but they cooled long ago. That cooling paved the way for the establishment of plate tectonics on Earth, which has shaped the planet we know today. Studying Io could yield clues about how and when such a huge transformation might have taken place. "We all would like to know when plate tectonics began," Khurana said.